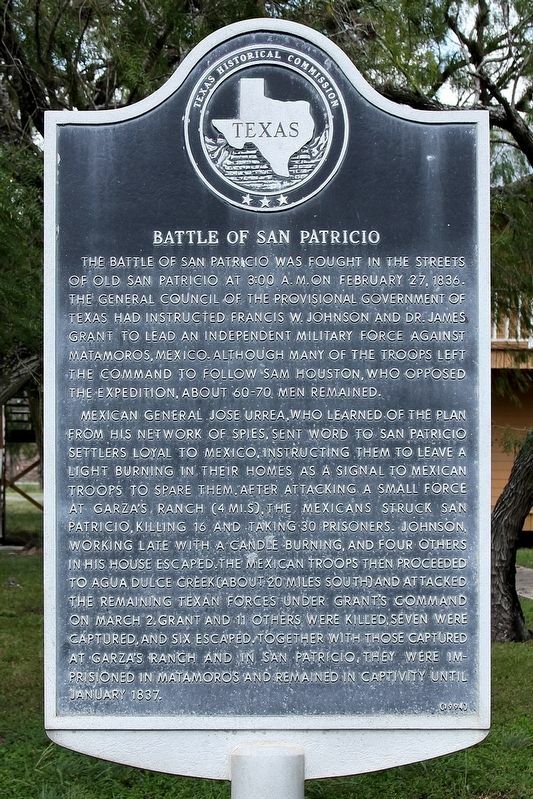 The battle of San Patricio was fought in the streets of Old San Patricio at 3:00 A.M. on February 27, 1836. The general council of the provisional government of Texas had instructed Francis W. Johnson and Dr. James Grant to lead an independent military force against Matamoros, Mexico. Although many of the troops left the command to follow Sam Houston, who opposed the expedition, about 60-70 men remained. in Matamoros and remained in captivity until January 1837. Location. 27° 57.115′ N, 97° 46.375′ W. Marker is in San Patricio, Texas, in San Patricio County. Marker is on Main Street (Farm to Market Road 666) north of McGloin Street, on the right when traveling south. Touch for map. Marker is at or near this postal address: 4615 Main St, Mathis TX 78368, United States of America. Touch for directions. Other nearby markers. At least 8 other markers are within 12 miles of this marker, measured as the crow flies. Josepha Rodriguez (here, next to this marker); San Patricio de Hibernia (a few steps from this marker); Saint Patrick's Catholic Church (approx. 0.2 miles away); Education in San Patricio (approx. ¼ mile away); Old Dougherty House (approx. ¼ mile away); Old Cemetery on the Hill (approx. 0.8 miles away); White Point / Rosita (approx. 11.6 miles away); Early Odem Area Schools (approx. 11.6 miles away). 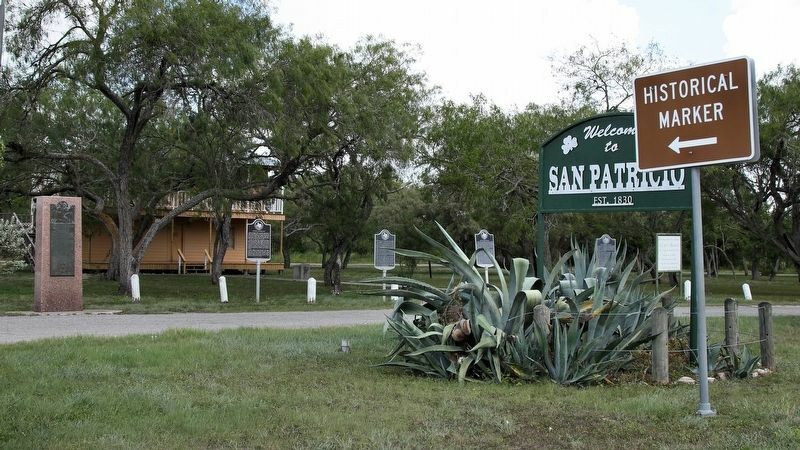 Touch for a list and map of all markers in San Patricio. More. Search the internet for Battle of San Patricio. Credits. This page was last revised on August 19, 2018. This page originally submitted on August 18, 2018, by Larry D. Moore of Del Valle, Texas. This page has been viewed 46 times since then and 12 times this year. Photos: 1, 2. submitted on August 18, 2018, by Larry D. Moore of Del Valle, Texas. • Bernard Fisher was the editor who published this page.